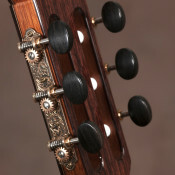 Below is a listing of available classical guitars by luthier John S. Bogdanovich. These guitars are for sale and can by purchased by calling 828-398-8704. Payment must be made in full before the guitars go out for approval. Clients have three days for approval. Guitars may be returned during this time if you are not satisfied. Returned guitars are inspected for damage. The cost of repair for any damage will be deducted from the original payment and the balance returned. Although this has never happened I have to say it anyway. We have shipped guitars all over the world without problems. This guitar has a western red cedar top and Indian rosewood back and sides. A signature rosette design with a quilted maple in the center highlights the top. The bindings are Macassar ebony. The guitar sounds great (recordings below) and is a joy to play. The guitar has a wonderful sound highlighted by its strong bass, clear trebles, with incredible separation and balance. This instrument is suitable for any genre of music. Listen to the recordings below by Alan Mearns. Alan is a native of Belfast Northern Ireland, switched from the violin to the Guitar at age ten upon watching an older friend play “Johnny Be Good”. Entering University with no formal training, he was the first guitarist to ever win the coveted Fletcher Scholarship, the only full ride scholarship available at ASU School of Music. Under the tutelage of Dr Douglas James, he went on to become a prize-winning classical guitarist, earning his Masters Degree in music performance with the world renowned virtuoso Dr Stanley Yates.